Welcome to the final junkmail snowflake post of 2011. Let us cheer. Rah rah rah! Okay. Alright. You already know how to make the basic snowflakes, right? I went over that back HERE. So what are these little guys, you may well wonder? Well, they are gift toppers. 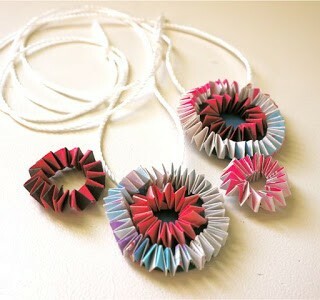 Use them on a gift in lieu of a bow or ribbon. How did I make them? It is a veritable breeze. 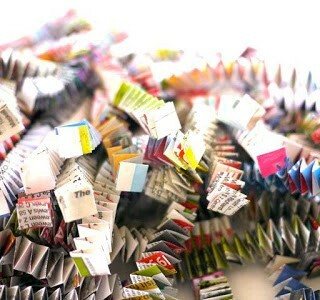 For this project, you will need: colourful junkmail, a foam meat tray, pair of scissors, hole punch, glue. 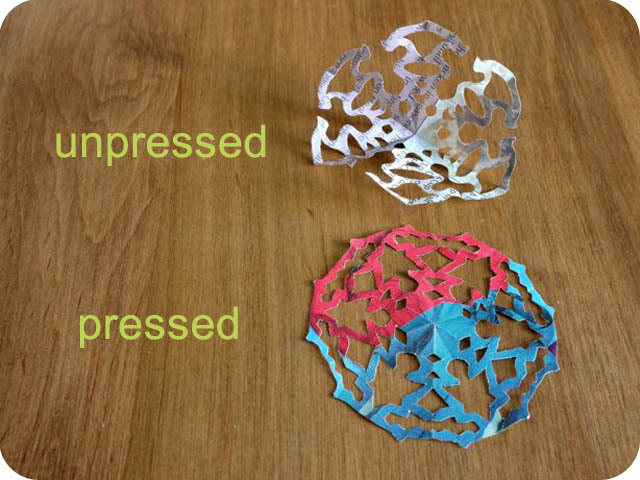 Step 1: Start by making two small junkmail snowflakes of similar sizes. 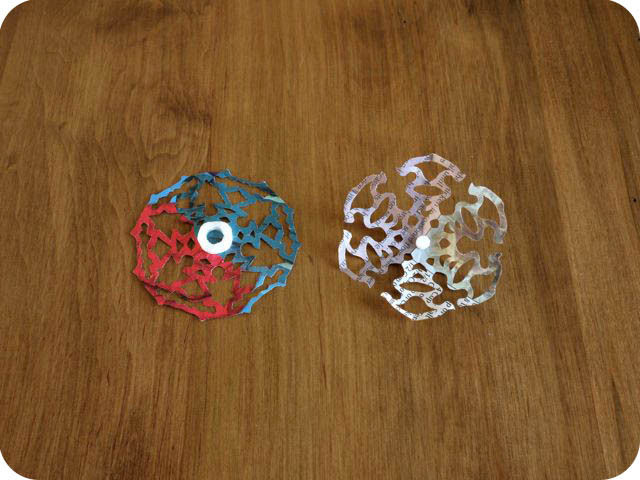 My snowflakes measure about 3 inches (7.5 cm) in diameter. 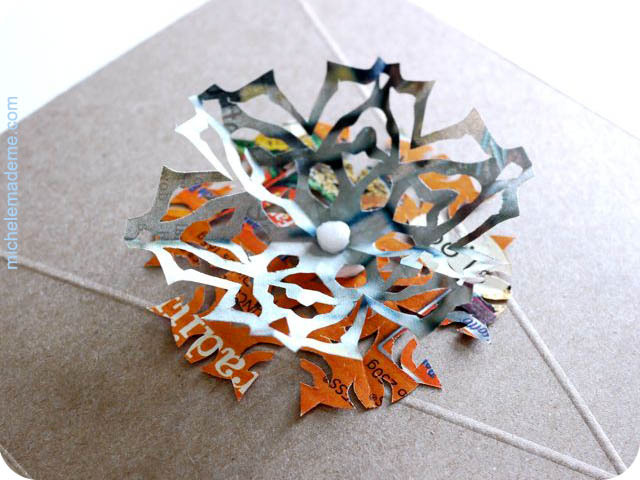 Use junkmail in contrasting colours for each snowflake. 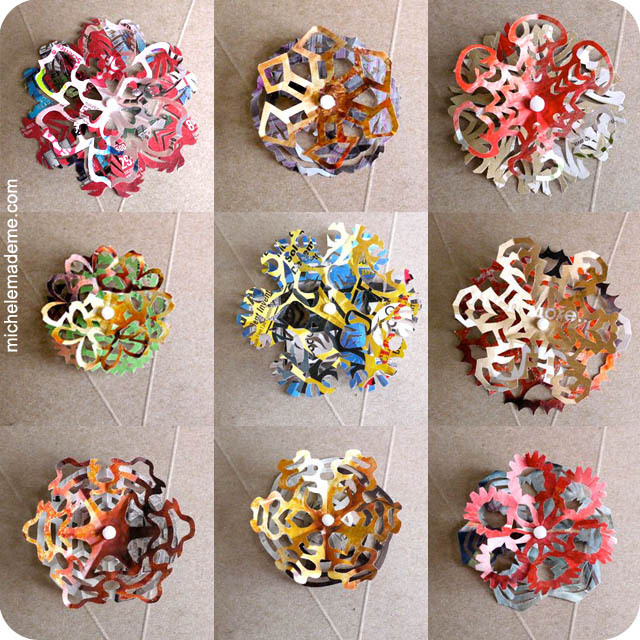 Note: DO NOT cut away the snowflake apices (the centers of the snowflakes). 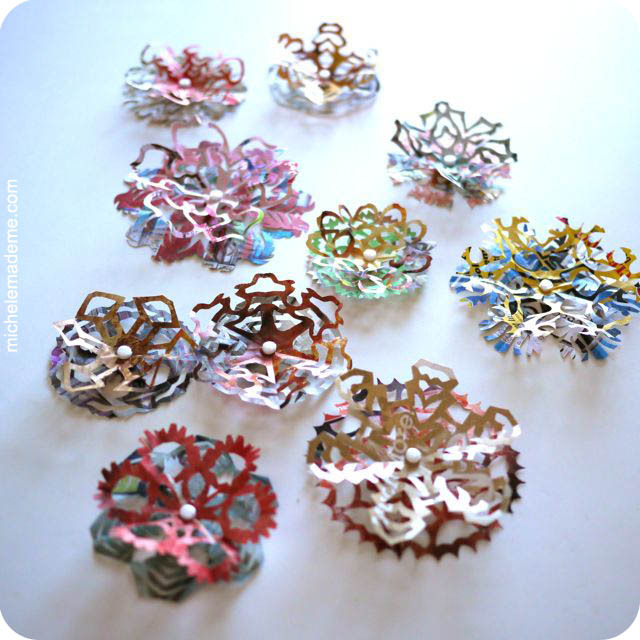 Press one of the snowflakes with a dry iron. Leave the other snowflake unpressed. Step 2: Go to your recycling bin and retrieve a foam tray. You know, the kind usually reserved for meat. 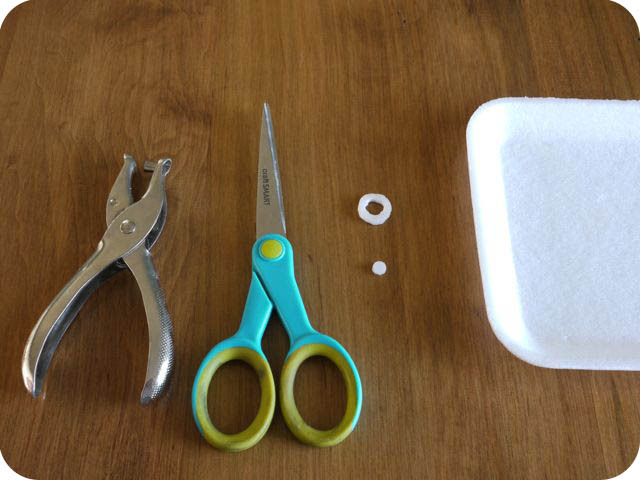 From the foam, cut out a small doughnut shape. Mine measures about 1/2 inch (~12mm) in diameter. Use your hole punch to punch out the doughnut hole. Save the middle piece of confetti. Now, using your hole punch, widen the hole in the doughnut all the way around. The hole needs to be slightly bigger than the piece of confetti. Step 3: Glue the doughnut shape to the very center of the pressed snowflake. 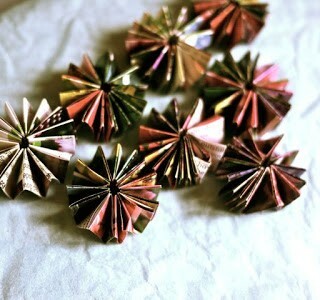 Glue the confetti piece to the very center of the unpressed snowflake. 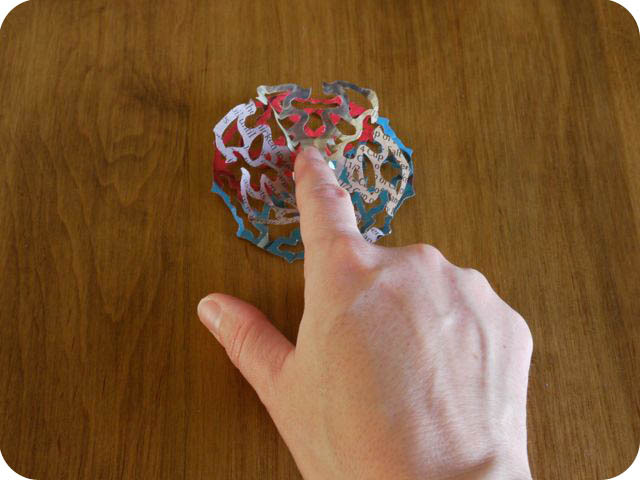 Step 4: Apply some glue to the center back of the unpressed snowflake. The glue should cover an area the same size as the doughnut on the other snowflake. Step 5: Now, place the unpressed snowflake on top of the pressed snowflake so that the confetti is aligned with the doughnut hole. Very gently, press down on the confetti so that it sinks into the doughnut hole slightly. This will cause the snowflake edges to lift up lightheartedly. 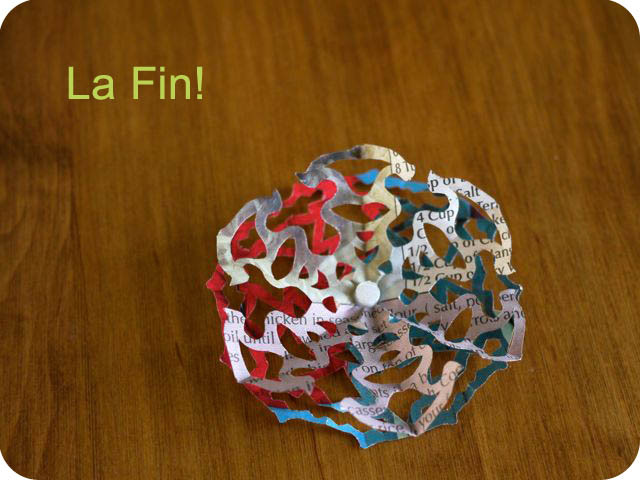 Step 6: And there you have it: one completed gift topper. Stick it on a gift and you’re golden! They’re really quite sculptural and interesting, eh? Goodbye my snowflakes. See you again next year! 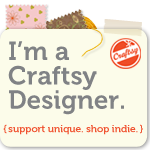 I like your site and all your beautiful ideas. From the first photo, I thought you used scrapbooking brads, but then when I read on I discovered no you – of course – used more recycled materials. You are one clever lady. These are lovely toppers. Have a great weekend. These are a-mazing! What an artistic alternative gift bow! Lovely! Very cute! I like every possibilities, but this third is even more interesting! You sure those aren't flowers? They are mighty pretty. 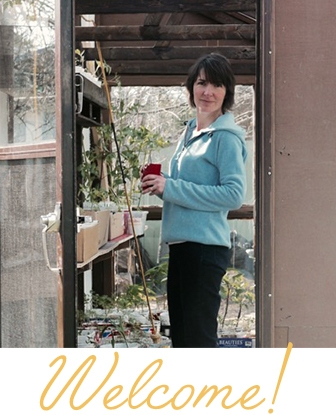 I want to trade junk mail with you! Yours is prettier! Thanks for sharing. Aw, Michele – so lovely. Very ingenious use of the styrofoam trays, too! I think they sell foam spacers at craft stores, but I never thought of making your own. I love this series, such a great idea! Well done! You make junkmail look so pretty! My husband got the Sunday paper today, so maybe I'll get some gift toppers ready from all those ads…. Really pretty! like always. Very happy christmas! Enjoy with your family. Kisses! Your genius and inspiration never cease to surprise and astound me! Your junk mail snowflake series is no exception. 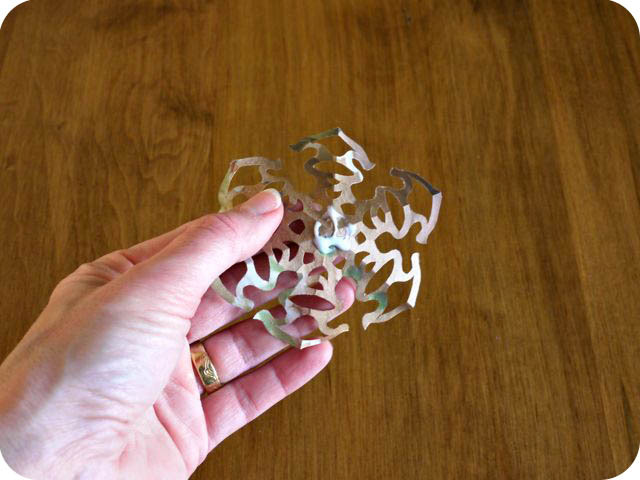 Normally, I would have been turned off by the idea of making snowflakes using junk mail. But your snowflake wall and these gift toppers compel me to give the idea serious thought. So beautiful! Well done you! These are terrific, but I don't have easy access to the foam—don't eat meat and Seattle has banned styrofoam take-out containers. Any tips for a foam substitute?